Nestled within Victoria Park is a new community of 30 single family homes designed in a mixture of Santa-Barbara and Bermuda-inspired architectural styles that embrace the eclectic nature of Victoria Park. These new homes are located just a mile off the beach near Sunrise and Federal Highway. This gated community features homes with an impressive list of features. You will enjoy wood, stone or porcelain tile on your main floor living area, carpeted rooms upstairs, wood staircases, raised panel doors, hurricane impact windows, two-car garages with storm rated doors, an outdoor kitchen in a large yard, optional pool or hot tub in your yard, fully equipped designer kitchens with 42-inch upper cabinetry and a full appliance package, luxurious master baths with separate tub and shower designs, and so much more. Homes begin delivery in November and December of 2015. Pre-construction pricing is still available with homes starting at $659,900 and an outdoor kitchen included in the price as additional incentive. 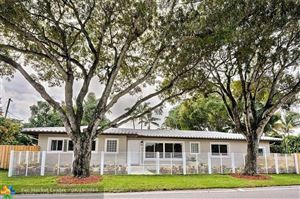 Listing courtesy of Southeast Coast Realty Inc.